I had to keep this project a secret for a while. 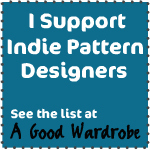 This is because I was chosen as a pattern tester for Sewaholic Patterns’ next pattern design! Tasia already announced it on her blog although it’s not been released for purchase yet until April. She gave me the go-ahead to blog about it so here is my version! I made this from a light-weight polyester crepe fabric I found at Fabricland. The contrasting pink cuffs are from a cotton poplin I purchased at Dressew. I really love this blouse! I sewed the variation that has pleats on the front of the raglan sleeves. I wasn’t sure if the wide neckline would work for me but I’m really happy with how this turned out. The way this blouse turned out wasn’t exactly like my original plan though. I had made my own bias tape for this project and at first I had sewn it to the neckline with the intention of having the bias trim sit on the right side of the blouse. However, the neckline was not lying correctly so I folded it to the inside and sewed it down. Now you can only see a hint of it peeping out. This ended up working really well! People have complimented me a lot on this detail. I have so much gratitude for the happy little sewing accidents that sometimes occur. One of my coworkers remarked to me that she loved the colours I had chosen for the blouse — this dark watermelon green contrasting with the candy pink colour. I was inspired by 1940s clothing in which I had seen this colour combination before. It’s a striking colour duo that I really like and am somewhat obsessed with. In my fashion illustrations and fashion design classes, I inadvertently and subconsciously designed with this colour combination a few times! I didn’t even realize what I’d done until I looked through my portfolio long after the classes were finished. I would totally recommend this pattern to someone, especially a beginner sewist. It’s so easy to sew and didn’t take me very long. You could easily sew this in one evening for a nice quick, easy, but satisfying project. I have sewn many Sewaholic Patterns and continue to be a fan. Tasia is a great designer and drafter and her instructions are very thorough. I think her patterns keep getting better and more refined as her business grows larger and more successful. I have literally been waiting for a sunny morning in order to take photos for my blog. It’s been pouring rain and soggy in Vancouver lately. I didn’t get a sunny morning but I got a non-rainy morning at least. I’m still learning a lot from self-teaching myself how to take decent photographs of my projects — lighting, fiddling with camera settings like the exposure, and using a simple photo editor on my computer. I don’t have a fancy camera; in fact, I just have a simple Canon Powershot point and shoot camera! For my needs, my current set-up seems to work well enough. There have also been some slight changes to the blog! I moved my blog from Blogger to WordPress recently and purchased web hosting and a domain name. I also purchased a customizable theme which I’m still fiddling around with. So throughout the next few months, I’ll be tweaking things when I have a spare moment. I hope to be able to get a banner designed for me in the near future as well. Hopefully there will continue to be lots of exciting things happening to me in the future in terms of sewing related things. I was recently notified that I was the winner of the Plaintain Challenge hosted by Deer&Doe! I wanted to thank my friends and family for their support and also to anybody who happens to read this blog or come across it. 2014 is off to great start! I was participating in the Saltspring Dress Sewalong held over at the Sewaholic website. I completed it this weekend, take a look! This pattern is perfectly drafted. I made no alterations and cut a straight size 4. It fits amazingly in the bodice! This is the third time I’ve sewn a Sewholic pattern and all times I’ve never made adjustments. I did however alter the straps so they tie at the front using Caroline’s idea from one of her variations, which involved sewing both straps to the back and making a loop at the front. (She’s Tasia’s aide over at Sewhoalic Patterns, and yea she’s got the same name as me!) I guess one other thing I did was lop off a bit on the end of the ties because they’re too long for me otherwise. The fabric is a polyester crinkle fabric from Fabricland. It’s got such a lovely pattern! I didn’t try to match the pattern at the side seams but rather made sure it was centred down the middle of the front and back. I also took care to line up the pattern for the back seam. I used Bemberg lining throughout the dress and added a skirt lining even though I didn’t really need it. I used the lining method suggested by Caroline. I handstitched the entire lining down to my zipper tape though as I prefer not to have things flying around loose! Linings make everything feel so lovely and luxurious! Well worth the extra effort. I am definitely going to get a lot of wear out of this dress. It’s going to transition well into autumn with a pair of tights. I’m warming up to the idea of having more wearable dresses with elastic at the waist. When done well, elastic waists don’t have to be tacky. I ate so much food today wearing this dress. Couldn’t have done that with something like my Lonsdale or one of my other projects! What a way to kick off the end of summer — I’ve got a new dress and successfully participated in another sewalong. I do have a funny story to tell about the Saltspring dress though…One day this summer a couple of weeks ago, I went to Spool of Thread to buy the pattern. When I go shopping for sewing related things, I have a laser focus and bounce from one thing to another in the store with blinders on. I take notes in my notebook and muse about future projects as I feel up the fabrics. I was pretty quick with my purchase since it was the only thing I wanted to buy that day. I turn my head to the left and there is Tasia! Standing right next to me! She had been at the store earlier than I had been, purchasing fabric and I didn’t even notice her the entire time I was there until I got up to the register. My mind froze. Here standing before me was one of the local sewing “celebrities” that I admire for her talent and all the hard work she’s put into her own small business. I tried to chat with her as calmly as I could but I was so nervous and felt like a buffoon. So Tasia, if you ever get to read this, I think you’re awesome and you’re as friendly in real life as you seem from your blog. That was the highlight of my week to get to meet you! Thank you for creating Sewaholic Patterns. It’s been great to follow along all these years through your journey and sewing your patterns has brought me great joy. If you’ve ever wondered what I actually did at my old job in the lab…well here’s a bonus blog post to show and tell! So today I went to visit my old workplace, the Psychobiological Determinants of Health Lab at UBC (University of British Columbia). The lab is sadly closing down at the end of June and moving to Chicago. My aim today was to bring peanut butter chocolate chip cookies for my former co-workers in exchange for taking silly photos! Silly photos of what? Of me with my hair curled and all done up in vintage style. My former co-worker (and close friend I still hang out with) Adam helped me take photos. Thanks also to my wetlab manager Gaye for letting me take photos. You will notice that the lab is a very unglamourous place, not at all like CSI or in other TV shows or movies. This is just a wee little lab tucked away at the top of the Kenny Psychology building. We actually take up multiple floors in an inefficient way – our offices and labs are spread out so we have to go up and down quite a bit around the building. Yes, those floor tiles are missing in the background. They’ve been missing ever since I used to work there! Still haven’t been replaced. This is one of two biosafety cabinets that I used to work in. The lab draws blood samples from the participants in our research projects…so someone’s got to deal with them! The cabinet is designed to protect me AND the blood or other things we work with. Everything has to be kept sterile. We achieve this by autoclaving everything and/or wiping everything down with a 75% mixture of ethanol and water. The lab always smells like vodka in the morning. Gotta keep my pens in place! Like I said, it’s sad to hear the lab is closing and moving. I worked here for about three years — started during the summer right after I graduated from high school. I managed to win a paid internship to work in a research laboratory! I’ll miss the ol’ place, and I still miss working with pipettes and centrifuges, doing assays on human blood like extracting DNA, RNA, or running ELISAs (Enzyme-Linked Immunosorbent Assay). It’s not the most glamourous looking lab or backdrop for a photoshoot…but I’m so glad I have this memento with me forever now. Maybe one day I’ll work in a lab again. P.S. The dress was sewn by me and the shoes are from Ruche! Installing these buttons were a bit of a hassle what with needing to use a hammer and all but I’m satisfied with how they turned out. If you’ve noticed, this blog post is late! But that’s okay, I made sure that I made this was a priority today once I got off work. Sometimes “Life” and my haphazard work schedule really gets to me. But someone awesome helped cheer me up last night! I baked cookies yesterday evening too, they’re peanut butter chocolate chip. So tasty! I’m bringing them into the ol’ laboratory, my former workplace, tomorrow morning. I’m also curling my hair vintage style so I can take awesome photos tomorrow…in the lab with a white lab coat and such! I’ve always wanted to take vintage science-y photos and indulge in those two parts of my life — the vintage pin-up and the nerdy science gal. Can’t wait to have photos from this shoot to put up! In other news, I’m also getting ready to do a mini revamp of my life after reading The Happiness Project…I’m hoping I can increase productivity and quit some of my bad habits and start good ones! I just have to think of some resolutions I’ll want to work on over the next few months. I’m thinking my Happiness Project might only be 4 months or so instead of a whole year since I’m already pretty happy already! Did you say single welt pocket? This jacket pattern doesn’t include pockets like these so I drafted them myself! Isn’t it pretty! I’ll be adding a silver button-snap on each welt and it will go well with the zipper I picked out for this jacket. The fabric is a this super pretty chambray with faded white flowers. I found it at Dressew! Speaking of which, I better visit it sometime soon and cross my fingers the heart chambray fabric I spotted months ago is still there. Those are the instructions I’d been given in my pattern drafting course. This is only the second time I’ve ever sewn a single welt pocket, let alone drafting my own. But I picked it up well and my first welt pocket that I did for class was perfect! And these pockets are perfect too! I love welt pockets. Welt pockets aren’t particularly too much harder than other pockets…other than the super precise precision that you need to sew them! Your markings and sewing better be exactly perfect! If you’re curious about the jacket pattern, it’s the Minoru Jacket by Sewaholic – she’s a local pattern designer that I really adore. Her patterns are quite well drafted and I only ever need to make small adjustments to the patterns. I own all her patterns! She doesn’t have too many yet but she’s working every day to add more to her pattern line.